If you notice a bunch of enormous trucks that are filled with sand around New York this weekend, it’s not for a sand castle competition. It’s the first line of defense against a terrorist bomb attack, as the city is on heightened alert for New Year’s Eve. There are expected to be about 1 million visitors to Times Square this Saturday to celebrate the New Year, all of whom will probably notice the gigantic sand trucks scattered around the area. Large bags and umbrellas are banned from Time Square this weekend. And while it’s not official policy, fun is also banned on account of the fact that revelers will be standing in the freezing cold for hours. 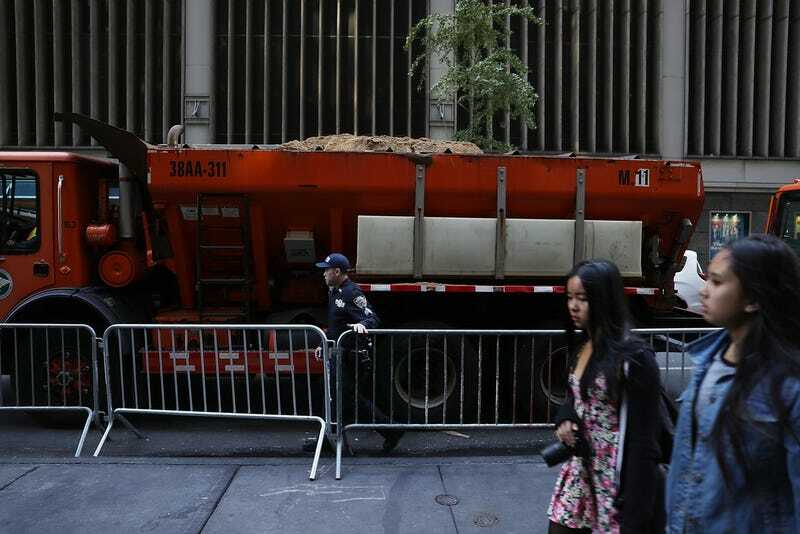 The large trucks filled with sand have become a familiar sight for New Yorkers, as they’ve previously been used in front of Trump Tower. Aside from absorbing the blast from a potential bomb, the trucks are also meant to serve as barricades to protect revelers from attacks where terrorists drive trucks into crowded areas. About 65 New York Sanitation Department trucks are expected to be deployed over the weekend. The security plan for the weekend includes much more than trucks, of course. The temperature on Saturday night is expected to hover around 35 degrees. It could not be confirmed by press time why anyone in their right mind would want to stand in Times Square with a million other people on New Year’s Eve. We’ll update this story if we can figure that one out.